Winds of Plague at the Ace of Spades on 3-18-11. 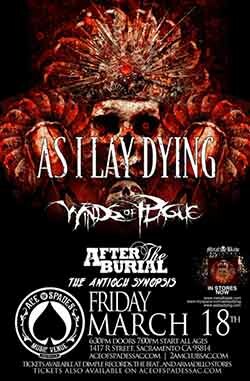 Metal Blade Records recording artist, As I Lay Dying, on tour with Winds of Plague and After The Burial. As I Lay Dying was touring in support of their 2010 album, The Powerless Rise. Unfortunately, at the time, Metal Blade would not allow us to film AILD live.